Our teams are experts in shopfront spraying onsite. In the UK since metalwork has started to replace wooden shop fronts, there has been a tendency to hand brush paint when decorating. This has changed over the past twenty years with the introduction of spray units that achieve a superior finish. Our aluminium framework recoating service is available throughout the UK. Vanda Coatings provide a cost-effective alternative to the complete replacement of existing metal shop fronts. 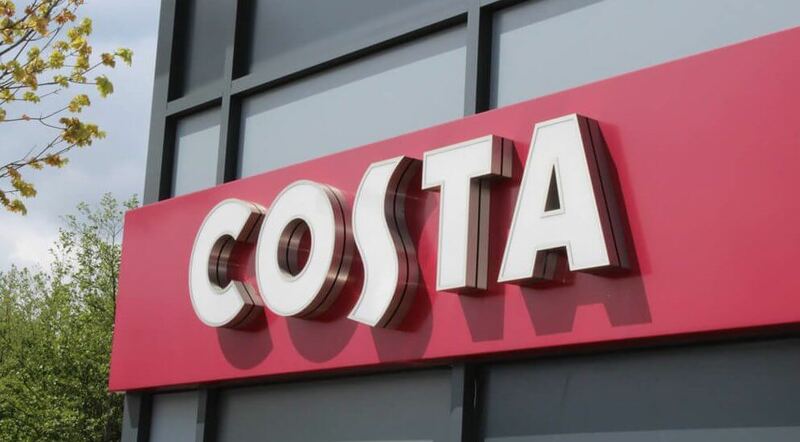 We work closely with shopfitters, architects, construction companies, shop owners and managers of high street chains to help achieve a high-quality finish completed in a tight turnaround. Our company understand the need for retailers to trade during their rebranding and we will work out of hours throughout the week to ensure that disruption is kept to a minimum. Shop Front Spraying enables the best finish on site. Previously powder coated shop fronts are an ideal surface to recoat. If there are signs of damage or corrosion, further treatment may be required which we can carry out before re-spraying. Aluminium shop fronts need to be etched prior to spraying so that the paint adheres to the substrate. If the bare aluminium surface is not treated before painting, the paint will peel within weeks of application, so our teams at Vanda Coatings take great care in their preparation before recoating. Previously hand painted shop fronts typically show up brush marks throughout the finish. To achieve a new powder coated look, the existing hand painted finish will have to be sanded and stripped back before the surface is re-sprayed. Architectural metal in retail outlets is not just restricted to shop front framework and we are happy to re-spray any other features. Because Vanda Coatings have extensive experience of working on many shop front projects, we normally carry out the spraying of roller shutters and associated guides and hoods as well. We also provide a full re-spraying service of all curtain walling section framing in retail and office environments to give outlets a new lease of life. The paint system used by our shop front sprayers on recoating projects is a two part epoxy polyurethane. This paint is extremely durable and hard wearing and offers a minimum of five years guarantee. It also comes in a full range of BS and RAL colours, so original coatings can be matched or new ones can be chosen. Our onsite shop front spraying teams have been trained up to the highest standards using the latest spray painting techniques (including electrostatic painting). Furthermore, all our employees have been certified and are continually tested in the safe use of mobile towers and MEWPs (Mobile Elevated Working Platforms). Our sprayers also carry CSCS cards. Vanda Coatings have immense experience in working in shopping centres throughout the UK. We liaise with shopping centre management and the client to ensure that all necessary arrangements are in place prior to shopfront spraying. Furthermore, we have public and employer liability insurance that allows us to carry out work. Very often major companies embark on a refit rollout in order to reimage all shops throughout the UK or in a specific region. Vanda Coatings can offer services to the end user or through main contractors who oversee the project. We have recently undertaken a rollout programme over twelve weeks for the Co-operative food group where we sprayed shopfronts including automatic doors, signage fascias and roller shutters from their old blue branded colours to their new fresh green and white colours. The programme involved spraying shopfronts on up to six sites a week in the North of England over a twelve week period. Our teams are fast and efficient and take pride in their work, always ensuring the result is over and above the highest standard.